What everybody wants to know, is "Why did you vote for him?". We knew he was a jolly drunk, but every politician and businessman in Canada is like that. It has always been that way. We have long, cold winters, and a huge amount of male depression. Drinking has been the traditional self-medication for that. The alternative was being a mean and nasty non-drinker like Harper. What we didn't know was that he had become an Uber-Drunk. Ethanol, like all the self medications for depression becomes less effective as your body becomes totally pickled. A happy drunk like the First Prime-minister merely drinks himself to sleep every night. But even with that, the ethanol becomes ineffective for depression, but you can't live without it. Enter cocaine and crack. This stuff allows you to stay up way past your bedtime, and continue the party. It's just a close relative to caffeine, after all. Unfortunately, you become way more than merely pickled, and quickly die at a young age. Everyday drunks can make it way past 60 before the liver fails. Rob Ford, nevertheless, made an impact for his few months. He scared the heck out of sleepy politicians and bureaucracy that supports them. I have never seen such responsiveness, and probably will never again witness it. There is question of whether this spurt caused more good than the later badness. I won't go into that. I find that with poor Rob Ford gone, the city bureaucracy is less responsive. They were terrified of him! Here's something that I hope the next activist picks up. All the rotund old men are sliding up and down this hill, inspired by the Rob Ford Situation (early death). Allow me to be right once in a while. We had a few weeks of deep earthquakes, and I detected a deep mantle shift, making the New Madrid strain gauges (tiny earthquakes) sing. Then I said we would see the earthquakes starting to rise again. I don't rely on the seismometers to tell how deep an earthquakes is, the error bars are ridiculous. Instead, I simply note the magnitude and the surface intensity. 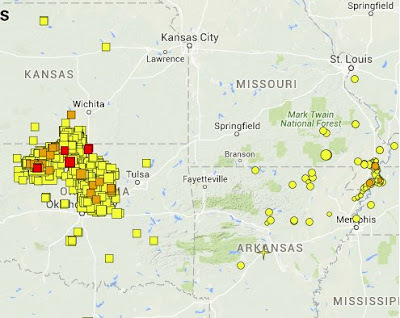 Deep earthquakes don't do much on the surface. Thus, today, we have a heck of a lot of activity. Note the last two. One is very deep, only giving an intensity 1, and the other is shallow, giving a 5 for the same mag. I think the next few weeks will be mostly shallow, probably giving some good 4's or 5's. Eventually, we will have a big surface strain event which will again ring New Madrid. Then the earthquakes will go deep again to the mantle, since the mantle is tying up the strain. How many times can we do this submarine act before the Big Whoops? I don't know . The Big Gus has joined our favourite warmists, in fleeing physics. Their new map is totally qualitative and can mean anything they want to mean, day to day. Not a speck of physics. Ever since the warmists brought out their spurious correlation, this 'new-speak science' has become just too attractive to the PR departments that now run all universities and government institutions. The number one rule of a political organization (as in PR) is to "Never Admit You're Wrong!". This is not the Scientific Method where the goal is to be proven wrong as many times as you are right (or maybe many more times, in my case). The warmists started it with their pencil-thin graphs that turned out to be a victim of semantics. Temperature not quite going up as much? It's still always the 'warmest year ever'. And that map is really heat energy with all the heat going into the oceans. Now BigGus brings that to their maps. What is 'damage'. Now there has been too much panic "Holy Crap!" from Ms. Hough. 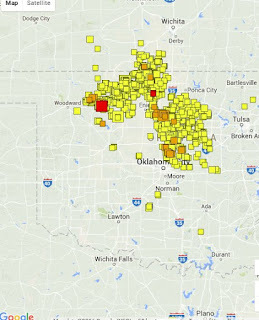 It only means 'cracking' in Oklahoma, or maybe just a headache. If it meant the same in California they would be laughed out of their beach chairs. Yes, that's right. As Susan Hough says: "Holy Crap!" Who knows what the units really mean? They have totally mucked seismic hazard and risk. Anyway, this place is due for New Madrid II, within a couple of years. They live in the dream that they have calmed things down by cutting down the injection, but that was cut down ever since cheap oil. I can make up plans for a tornado and earthquake proof house, anybody? ps. Weird. For me, the seismic hazard is expressed as chance of certain level of PGV. It has nothing to do with buildings or damage. Seismic risk is when you calculate a seismic capacity in PGV, and then do the chance of exceeding it. If everybody builds concrete domes, then seismic capacity is high and no risk. If the buildings are concrete with empty cans, then the risk is high. pps. Nobody is explaining that map. Here's a monster article. add: M4.2, a new round begins. add again. Now the busgus is watering down the panic. They say OK is only 5 cm/s (cracking damage), and Callie it 30 cm/s (structural damage) for the same colour. That's a crap-out. I now buy a lot of stuff directly from China. It's easy to use Aliexpress, and keep everything under $20 if you want to stay under the arcane Canadian limit. I have had a 100% success at getting good stuff, but recently I have suffered with the adxl345 accelerometer boards. The local internet price is $16 for a breakout board that you know will be perfect. But I can get them direct from China for $2. What could go wrong? Everything. The first batch was all wonky after I tested them. The second batch, with a different board, from a different seller was all perfect when I tested them using the first i2c address. Unfortunately, they shorted when I tried the second address. If you want to put two on a single i2c bus, which I want to do for my production accelerometer, then this is bad. Fortunately, Google loves us, yes I know. I found this link. This was classic board disaster, thousands of those must have sent to the crusher, only to be saved, Sar Wars fashion, by the ingenious Chinese. This is what you get for $2 -- rejects. But the fix is dirt simple. I made a mistake the first time when I thought you shorted out the R4 resistor, but that's stupid, since it is a short anyway. You melt the solder and scratch it out, and leave an air gap. A perfect accelerometer with the second address, when you put SDO high. Yeah! I'm not buying anything more because I'm in the doghouse with the wife. And I really want a raspi zero, but you can only buy them right now in expensive kits. As just proven by my daughter's card, it is now ridiculously easy for someone to make a new card from near-public info, and go on a shopping spree in Buffalo. They don't close off travel areas any more, because their 'anti-fraud is so advanced', or so they tell me on the phone. This is only noticed on your bill, and then you don't have a card any more for a week or two. Make sure you have another card. It's so easy in Buffalo because the US doesn't have many chip terminals yet, and fooling around with the mag stripe is child's play. Anyway, expect this soon for everybody, it's just too good of a scam. Another billion lost by the big cards, who cares? I just did this because of the huge rain coming. The pixies haven't done much since the last time, but they are ready to sling a bridge section. Won't be able to do in the rain. ps. The big rain is going to miss us. I'm on the verge of my biggest breakthrough yet in the Mad Labs. But first, some background. I have said before that the soil foundation dominates seismic hazard for your house over being in California or Oklahoma. You can be on the solid footwall of the worst earthquake California has to offer, and only be woken up by the sounds of transformers exploding down in the valley. Similarly you can be on quicksand like High Park in a soft brick house, and have the worst risk of death in the world, even in staid old Toronto. How do you know? By doing a seismic noise analysis. My new Raspberry Pi 3 will have 4 accelerometer chips chained up like a seismic array, and it will be good enough for a seismic noise test. Basically, you run it in your house during a work day, but without people and pets stomping around. Then you run it in your basement, or on a slab outside. You only need an hour or so. Then you calculate the power spectra of the noise. A good house or concrete building will be fairly stiff at maybe 5 Hz. So you should see a 5 Hz peak. On the basement you should ideally see no peak, that would be very hard ground, and we are assuming the daily noise is flat. A very bad case is that your building and ground peak are strong at 1-2 Hz. Then you better glue down everything and get earthquake insurance. The big mistake of earthquake engineering is that everything is sinusoidal and matching frequencies cause resonance. Not true if you look at the physics and simulate everything with finite differences. Then you find that matching frequencies makes one big bullwhip, with your house at snap end. Not good. I'll soon have it set up and try it on my house. That's all I can do, since I live in the basement. It will up to others to do a lot and publish the results. The next big earthquake is the test. ps. here's a picture with all 4 accelerometers wired up. A deep M3.6 earthquake indicates lower mantle motion. 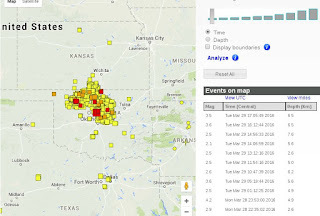 More than that - the past few weeks have shown very deep earthquakes, and unusual activity at New Madrid. Last December, a remarkable series of large earthquakes also rang New Madrid, which is the best strain gauge available in the area. In active areas, these deep strain events happen all the time, and don't mean anything. But the physics makes it almost impossible to happen here, yet here it is. Had anybody bothered to image the crust they would have found a line, called the Moho, below which there is no structure, and no earthquakes. Yet, this stuff is like Silly Putty, and is semi-rigid. I'm only posting this because it may prove to be significant in hind-sight. I would imagine that New Madrid would have undergone some of this before 1811. It is essential for a large earthquake, yet it doesn't presage one. I suspect this is a response from the December event. Slowly, the earthquakes got deeper and applied the strain to the putty below the Moho. It has now responded, and the earthquakes should slowly rise again. As usual, we shall see. Thanks to Stanford and such, OK is convinced that all this is due to volume. A close examination of the rock mechanics (physics) shows this to not be the case. They are continuing to inject more fresh water as the gas wells start up, and we expect a busy season. I blame it all on the warmists. They were able to use semantics and philosophy to set aside the Scientific Method and create the new Consensus Science. Now everybody has jumped on that bandwagon. This thing has a tiny flashlight battery and claims to be Jedi Technology. A little physics tells us how much oxygen we need to breathe, and the volume of water that holds that amount of oxygen. A little more physics tells us we can't breathe pure oxygen, it's like drinking pure ethanol. In reality we would need gills the size of a whale shark's, and a heart-lung machine to put that oxygen directly into our blood-stream. Wait wait! I got one for crowd funding. Now we get to the worst part of my fears. Remember that this is a work of fiction. My mind does not accept that any of this is actually happening. The pixies have stopped irritating me by moving piles back and forth, and are now going for it. They will cross the river and completely remove the toe of the slope. If my fears are realized this will cause all the houses to visit the river. But most likely, nothing will happen. Unless they pin the bottom rocks with rock bolts, the same process will continue. However, they will most likely pin a mat to the surface and that should look very pretty. These things are mostly for political appearances. My old 30 year roof has hit 25 years and needs replacing. I look as forward to this as I do to Geotechnical Nightmares. We had a friend of the family do to the roofing, and he was good as anybody. But he missed all the things to get the roof to a ripe old age, such as the overhang, ventilation, and other stuff. All have caused endless irritation. All the neighbours have got their roofs done by the lowest bid. One is selling and the best they can say is that there are 30 year shingles. People I have known have had trouble with the flashings, and had to bring back the contractor again and again. No luck if the guy takes off. One new roof had a shingle fly off and break my basement window. That was my excuse to get new windows, which Walker did as well. Wouldn't it be nice if their were a CSA standard or a building code for this? No such luck. But the shingle makers have a certification process somewhat like Micro-suft. There is a thick code book, and they make sure the job is done right. This gets a full, very hard-core warranty. If you buying a house, you should look for this, and add 20K to the price, just for the worry-free-ness. I'm getting the job done by the above, and there is huge amount of extra construction before they even attach the shingles. The old part of the house needs soffit vents. The chimney needs a saddle deflector, all sorts of things that nobody else would do. Any shingle warranty has tons of fine print about these things. So, there is a sticker shock. But you should get some back when you sell. I'm going with it. A while ago I had this router, and after endless troubles I finally got it working with openwrt. I didn't want to fiddle with it and find out what actually worked, so I got a new one, which will act as an ac bridge for an old laptop. These are super-cheap, order them from Aliexpress, and request them without the box. For Canada, one at a time, and something without a box is worthless, right? The key trouble is that the latest firmware is all in Chinese, but you get one in English. You must write down all the steps to change the ip address, so you can put in on your main network, and use Google translate. Use an old Linux laptop. If you are really super-cheap enough to use this router, you have one. Plug in the mi, and hook up an ethernet cable to the laptop. Power on or use 'pump' to get an ip address. It will be something like 192.168.31.52. Now you know the router is 192.168.31.1. Go to that with Chrome. Yeah, it's all in English! Not for long. Next page, hit upper box, set up wifi. In the middle box with the eyeball, enter a password over 8 characters. Hit the bottom box. Next page, enter the same password (easier to remember for now), in the box with the eyeball. Hit return. Wait for a while until the bottom bar is complete. Hit the only box. Remember that all this will soon be in Chinese. Hit the bottom box 'save' It will come up with a pop-up. Hit left button (ok). Wait until blue light comes on. Power off. reconnect ethernet to your main network, have a coffee, and wait for the blue light. Now it reboots. Put away your laptop and connect the mi to your main network. Since I'm following along right now, I find it doesn't connect to the ip number. Repower and it still doesn't connect. Must have been a typo. Press reset button, connect to your laptop and do it all over again. Have a nice reset pin handy, hold until the light flashes. Do it all over again. Wait for blue light. Do it again (drat). Have a glass of wine, and wait for the stupid blue light. Now for the Chinese. If the stupid site is always busy, follow this. This takes to the dev site, remember that it is a mini, and hit the right blue box under 'mini' for a download. Manually update the mi. Wait for the stupid blue, and go back to that ip (yeah, it didn't wipe it). Now you have a Chinese menu. login and get the stok number as explained in the openwrt page. Construct the urls by going to the end of the stok number.. Things to note. Telnet to that ip number and get into their commands. Use this to get the miwife sysupgrade.bin. Don't download (I did that!) but copy link address. In the router, cd /tmp, and wget the .bin. mv it to firmware.bin and follow their mtd command. Have dinner. Connect your laptop, reset the stupid thing. Reboot your laptop. Wait a long long time for a solid red light. Darn thing didn't work. Copy your dev .bin to a usb fat32 and rename it. miwifi.bin. power, load usb, press reset until flashing. damn light turns blue. Start from step one, only in Chinese. Lots of wine. My main problem comes from not drinking enough wine. I don't wait long enough and can't tell the difference between orange and red. I'm waiting for some smartass saying 'I did it all the way through, once, with no wine." Anyway the Chinese interface doesn't resemble the English, so right now I am fumbling. My only hope is that I did this months ago. Oh yeah, after you set the passwords, repower. Now you are back in action. WAIT FOR THE STUPID BLUE LIGHT! IT TAKES FOREVER. Oh the horror! On the miwifi, wget was not working. It was only grabbing a tiny bit. I put the whole openwrt driver on a usb, then I looked as dmesg on the router. I could then mount it and copy it to /tmp where I could activate the mtb. pss. Good thing we know how to do it all over again. If you botch your configuration in openwrt, you just can't reset, because of the weird bootloader. You have to boot with xiomi dev firmware, and start all over again. Doing that now. ppppps. Doing it all over again. I've done the access point, now I'm trying to make it into a bridge for a laptop. One mistake and you're toast. For instance, I bridged the lan before wifi joining, and suddenly I can't access it any more. poohey. final note: The mifi cannot act as a simple transparent repeater bridge. That requires the broadcom chip or aetheros chip. It is only good as an ap. Here's my letter to my Liberal MP. I know he'll get it to Justin right away. Hi Borys, I'm a retired guy, and former expert on earthquakes. I do my own blog and have about 32,000 readers around the world on google+. Not really that much, but one thing I have been doing is developing better earthquake equipment that is super cheap and can be made by anyone. That requires that I import development electronic chips direct from China using Aliexpress. The unreasonable barrier is the measly $20 limit on importing these things duty-free, since I am super-cheap. This amount hasn't been changed since I first voted. The US has something like $100, which is why my son moved to Palo Alto. Not really, but he is developing something really great with all the bright engineers from UofT, and couldn't do it in Canada. He is great friends with the guy who invented the Pebble Smart Watch, who also had to escape. The things sending these people out is Canadian fuddy-duddyness. Do you know what corruption you have to waddle in to get a development gov't grant in Canada? I overheard some people hiring a bagman in a restaurant and I was shocked. The mma8451 is another accelerometer available for $5 that was the model for the fiendishly complex mc3610. This must be 'west coast' and the adxl345 is 'east coast'. Anyway, the tests put it at the same discrimination as the mc3610, but not as good as two adxl345's. However, the calibration the $5 board is infinitely better than the cheap Chinese $2 adxl's. If my new shipment from China is as bad as the last one, I may go with these for my dream el cheapo accelerometer. I'm still waiting for the raspi zero to become available in volume before I move on much. The basic idea is too have an open design that people can do themselves and then set them up in the richer houses of Oklahoma. You'll need 'unlimited' Internet (you use Netflix a lot) and a big hunk of space in Google Drive. I hope to get it to something like $20 of parts and an hour of labour. It'll be fun! Here's the main Python driver for 2g and 200 Hz. The program samples at 100 Hz. Once again, the spec sheet is crap and I had to fool around. I suppose they do that to allow people to keep secrets. I never keep secrets. Go ahead, busgus, outdo me! ps. I've ordered 4 from China (cheap as the adxl345) to see if they are seconds, like my first batch. Stanford has issued a bold statement. The PR department has gone directly to 'Theory' based on one graph. This is somewhat familiar to regular readers. Pressure: I am postulating that the Precambrian is a free drain, no amount of injection increases the pressure. There are pressure readings. Volume: Volume of produced water has gone down by half due to the low oil price. Earthquakes haven't. Anything else? Has anything else gone up? How about fresh water injection? I've been trying to get the mc3610 to work *forever*. Now, I have finally written the Python programs to get this to work. It doesn't help that their sample driver for Arduino is crap, or their spec sheet is inconsistent. These guys make the Dementors look like buffoons. So, for the Raspberry Pi, you install pigpio library. This allows you to directly bit-bang the stupid thing. Here's the Python driver. I only have 2 options, and I just changed the sampling to 200 Hz without commenting, because that's where the spec is bad at 100 Hz. Now you can run a python program doing things like plotting or here, calculating the average. This accelerometer is marginally better than the adxl345, but not as good as two of them chained together. The adxl345 is $2 from China, but I had difficulty buying good ones. My second attempt is taking over a month to ship, and I pray to get them soon. If you can find working versions then you chain a lot together for one $16 mc3610. DON'T BUY FROM THESE CRAZY PEOPLE! I learned that c++ is horrible, and I like Python. The Raspberry Pi is fantastic with all the support. ps. The pigs library was a great thing because I can now make a second i2c from the other lines. No need to go that 'mysterious' underneath second i2c. I had thought they would have run out of things to do, but no, they were emptying bags of gravel and filling them up again. I suppose they have to go through every bag. **NOTE There is no way my brain acknowledges this as real. I am in a delusional state, and these are just images from my fanciful brain. Nice dog. Here's the review I wrote for it. I'm sitting here drinking one the finest coffees I ever had. This is a huge bag of *ground* organic Guatemalan from the Antigua area. We visited that area, and the coffee right at the plantation is marginally better. Coffee grows on a tree resembling a Cherry tree, with bright red cherries. The bean is the pit. They mush it up and use the mash as compost. Then the beans are dried in the sunlight, and further processed. It's all very organic because they shade the coffee trees with larger trees, which they trim according to the season. The birds love it, and the civet cats merrily munch the cherries and poop the most expensive beans in the world. This is prime 'arabica' coffee only grown at 5,000 feet on the sides of volcanoes. You can always see a mountain smoking in the distance. Lots of earthquakes, too, so coffee is the product of a violent geology. You only use a medium roast for this grade of coffee, dark roasts were invented for the inferior 'robusta' coffee, although I do like a dark roast. Only use the Secura stainless steel French Press, and Brita filtered water. And only drink it black. It has a fine nutty taste, with a slightly sweet aftertaste. Well rounded. Immediately upon delivery parcel it up in Foodsaver vacuum bags (All of this available on Amazon). I don't think they have Antigua beans in the large package. I had thought these were beans, since that was I was searching for. Nevertheless, it is a perfect grind for the french press. ps. Use much less than you normally would or else you will feel the caffeine hit. We're talking a very high caffeine load, dark roasting destroys a lot of it. All the news is full of the big OK injection reductions. They are going to cut injection by 40% from 2014 levels. What they don't say is that injection is already down a half from 2014 due to oil and gas prices, and the earthquakes keep coming. They have to 'upgrade' what they inject. They used to inject deep water from wet oil wells. As long as that water had percolated up from the Precambrian, they they could inject all they want. As soon as they started washing the old oil plays with fresh water they had earthquake trouble. Oil and gas fracking all use fresh water. To the deep Precambrian, fresh water is like a powerful acid. Nobody seems to know that, but it is so easy to test in a lab. This will not happen, and also nobody will map the Precambrian with old seismic reflection data tapes. That is why this all so much fun! Spoiler Alert - This doesn't work! No, I haven't got is 'quite' working yet, but right now I'm sick of it, so I'll write about it. The MC3610 is a brand new accelerometer and the breakout board has just come out. Now, the 5 year old ADXL345 works perfectly with Python. That's the thing about Linux, 5 year old hardware works perfectly, the new stuff never works. Somewhere along the line the Great Linus put up his finger and carved into stone: "Linux will never support I2C repeated starts, not now, not ever!" So that got me royally screwed, since the bums made this chip 'repeated start'. It's great when you have multiple masters on one i2c bus, but who does that? So drop all that kernel support and go directly to Jail, in this case ioctl commands, or bit-banging. The Horror! After mucking around trying to do it the easy way, I finally found 12crw, which is C code (I used C++) for bit banging. Lot's of fun since c is a teensy weensy bit different from c++. The reason I had to go for horrible c is that the only driver is written in c for the Arduino. The mc3610 is a complex computer in itself, and has a heck of a lot of commands. You just can't tell it 'Get me the damn accelerations', no you have to write specific bytes in specific registers. The driver had all these commands. The mc3610 c driver worked with Arduino, because of the long and horrible program 'wire.h', which, apparently, nobody can understand. It accesses i2c at a primitive level, which is why it works. The raspi is a sophisticated machine running full Linux. So I had to convert the driver to c++ and use the i2crw calls. Here's the darn thing. unsigned char bWAKE; // Sensor wakes from sniff mode. unsigned char bACQ; // New sample is ready and acquired. unsigned char bFIFO_EMPTY; // FIFO is empty. unsigned char bFIFO_FULL; // FIFO is full. unsigned char bFIFO_THRESHOLD; // FIFO sample count is equal to or greater than the threshold count. Note all the wonderful definitions. and finally the main program, still using the mc3610 header. I've compiled each of these into '.o' object files, and I'm about to mash the thing together. Maybe I'll do it tomorrow. I had hoped to work slow enough that somebody would take this on, but nobody seems to have the board yet. ps. It turns out that driver is total b*llsh*t. It sends the wrong values. I got through using manual bit-banging and am now writing that in Python. I had to get this in before the big flood. ps. right now it is getting warm. The snow could melt gently, and the land is fairly dry. No flood yet. Not much happening in my brain. The pixies are just trying to drive me nuts by not doing anything. Recently, they have all been at one spot. This was a 4.3 that just happened. Most appear to be quite deep, as their intensities are quite low. I have no idea as to what could be happening. When they are this deep, no fluid is touching them, they are a response to regional stresses. I had expected earthquakes to propagate up to the NE but this isn't happening. We'll have to wait.